and would not give it up. Brigabear Commanbear Braxton and I, Srg. @ Paws capeing Skipper during Caping Ceremony of the Reddy Teddys. 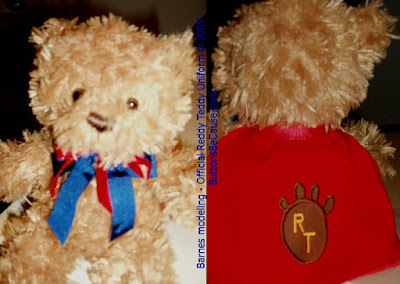 Brigabear Commanbear Braxton heads up the Chicago chapters den or hug and I, Sargent @ Paws head up the suburban chapter. Hey guys! About-face! They are showing off their uniforms, it kind of makes you want to go hide doesn't it? You say you never heard of the Reddy Teddys? Earlier this summer the four little city bears decided that if hamsters and guinea pigs could be super heros so could they. All they needed were superhero capes with their own special logo. Thus, the Reddy Teddys were born. Now you ask what is a Reddy Teddy? We are supbearheros, always ready. Reddy Teddys we are; In the home or in the car. Yet never ready to pick a fight. Thanks to capes so lovingly sewn. Reddy Teddys start with the heart. Ready to cheer you when you're blue. So remembear we love you too! 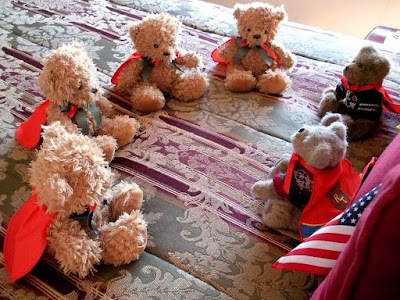 The morning after our Reddy Teddy meeting and ceremony I received a couple of photo updates from Brigabear Commanbear Brax. 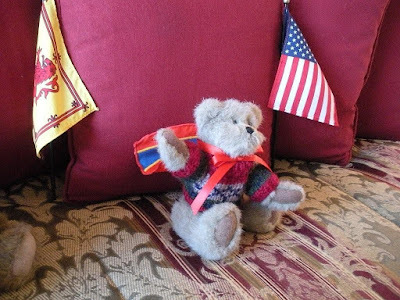 See I told you it was a Scottish bear den, they have a Scottish flag. 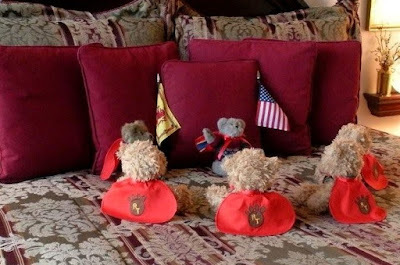 Reddy Teddys Morning - Roll Call just shortly after sunrise. I think the first item on their agenda was a later morning roll call. I know it would be mine, just after sunrise, a tad too early for this bear! Thanks Braxton to you and your dad for the contributing photos. Could Charlie be a commander in the reddy teddies. He is very big, but he wants to cheer up the world. I really like their capes. Maybe I can talk Mom into making me one like that! I do think the Reddy Bears are a very fine sounding group. I am sure I will have some new volunteers for them - am wondering if red is my colour? WOW! I bet yu guys are grayte at Synchronized Sitting!